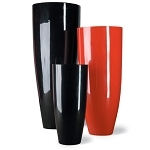 These planters have clean lines and can come in various shapes and sizes. They look great in pairs, in groups or by themselves. They can be used to compliment décor with Zen theme, beautifully flanked front doors, walkways, tabletops or anywhere else. They can be made from various material and used indoor or outdoor.